I like trying out new ingredients as much as new recipes. On a recent trip to the co-op, there was a beautiful display of pints of tomatillos, and I couldn’t resist. I’ve been wanting to do something with tomatillos for a while, and this seemed like the perfect excuse. There are a ton of salsa verde/tomatillo salsa recipes out there, but this is what I wound up with. I perused a few existing recipes, poked around in the refrigerator, and threw this together. If you want a completely raw salsa, use the juice of a fresh lime and toss in some minced fresh cilantro. Combine all ingredients in a large bowl and stir until well combined. Serve as is for chunky salsa. If you prefer a thinner salsa, puree a portion of the ingredients in a food processor to the desired consistency and together with the remaining chunky ingredients. This came out so good that my mom and I decided to season our favorite tempeh burgers a little differently so they’d go well with salsa on top. Instead of Italian herbs, I tossed in some chili powder, cumin, and oregano. 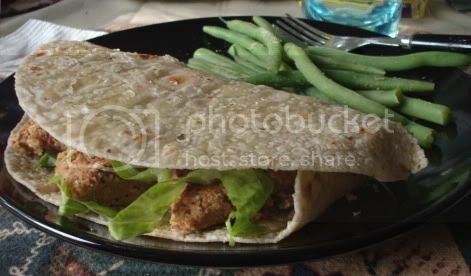 Then I cut mine up and folded it in a brown rice wrap. In the background are some of the delicious fresh green beans we’ve been picking by the bagful. Green beans have always loved the soil in our yard, and this past picking expedition yielded 14.5lbs. Yes, that’s 14.5lbs of green beans, with more coming. I love summer! 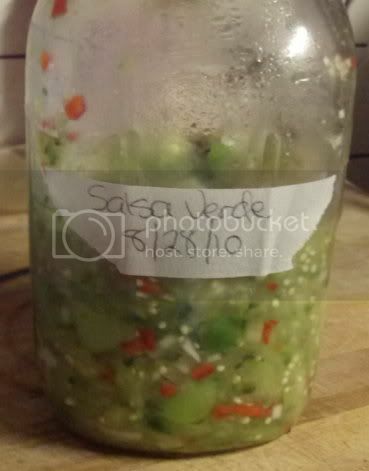 I love salsa verde! Nice job. Thanks! I’ve discovered that I love it, too. Definitely going to make more things with tomatillos in the future.